Mark: Hi, it's Mark Bossert. I'm the producer of the Pawlik Automotive Podcast here in lovely, rainy Vancouver. And we're here with Mr. Bernie Pawlik, Pawlik Automotive in Vancouver. Vancouver's best automotive experience. 19-time winners of Best Auto Repair in Vancouver as voted by their customers. 19 times. And we're here with Mr. Bernie Pawlik. How are you doing this morning, Bernie? Bernie: Doing very well other than it's rainy and extremely rainy. Mark: Well, welcome to 1919. So, 2019 I guess. Mark: Let's get in the right century. Although we are going back in time. We're talking about a 1975 Chevrolet Corvette that had an EFI conversion. What was going on with this classic vehicle? Bernie: So this vehicle was pretty much stock Corvette. I mean, the engine had some work done on it. Not sure if much in the way of modifications, but essentially stock Rochester 4-barrel carburetor, HEI distributor. The client's concern was that the vehicle would tend to get flooded and it was hard to start, if not impossible. So we did some adjustment on the choke. Got it set up as best we could, but it still was never a really good experience. You start the car up, it would run for 10 or 20 seconds and stall. There was wear in the choke linkages and things. It was just things that wouldn't really allow us to get everything set up perfectly. So that was basically the best we could get it and between cold start and a hot warm up and we're talking like 15 minutes driving, there would be some stalling issues or it would idle too high. Never quite perfect. That's kind of the best we could get it was to prevent it at least from flooding. Mark: And so what did you do to repair this concern? Bernie: Well, I talked to the owner about it and he said, "well, you know, I'm not super happy with that idea." He goes, "why don't we do an EFI conversion." Basically converting it to fuel injection. I said, "hey, what a great idea. You know, that'll eliminate all of those issues and bring the benefits of a modern fuel injection system to the vehicle." So that's exactly what we proceeded to do. Mark: So what does that involve? Bernie: Well, what that involves is removing the old fuel system. So we removed the carburetor, the old mechanical fuel pump, and then install a fuel injection unit. It's a throttle body fuel injection unit. It's made for quadra jet carburetor. Quadra jet carburetor has a smaller primary openings and larger secondaries. It's a unique GM feature. Anyways, this is a bolt on quadra jet conversion, so you bolt on a throttle body unit. Then there's a few sensors that need to be installed. A coolant temperature sensor. An oxygen sensor in the exhaust. And it need to be attached to the ignition system, to get an RPM signal. Powers and grounds, of course. And then, the sort of larger part of the process is providing it with high pressure fuel. So, the gas tank has to be removed. A new fuel strainer put in. High pressure pump needs to be installed with fuel filters and then a return system also needs to be installed so the pressure can be regulated to the proper level and returned back to the gas tank. Mark: So a lot of work basically. Bernie: Yeah, a lot of work. I mean, it was a couple of solid days worth of work to do the job. Mark: And how did the job go? Bernie: Really well. It went fantastic. I mean, it just step by step, and the fuel tanks are kind of a pain to remove in this vehicle, but it was good mounting locations for the pump. The one little hiccough we ran into, for the fuel return line, fortunately there was actually two metal lines in this vehicle, the main fuel line and there was also a small, quarter-inch diameter fuel vapour line that ran parallel with the fuel line back to the vehicle. It hadn't been used in a long time. It was sort of just kind of disconnected, that emission piece so to speak. But the fuel return line was there, so we were able to tap into that. Unfortunately, when we fired the vehicle up, the return line had a big rust hole in it. 1975 car, you know, it's got quite a bit of miles on it and anyways, there was a rust hole, so we had to replace a couple of sections of fuel line. But other than that, flawless. Mark: And do you have some pictures? Bernie: I do. I got some pictures. We're going to start with a video here. This is ... I had a few videos I wanted to show, but due to technical difficulties, we'll just show the video here. This is the, you can see this okay? Bernie: This is the completed job, more or less completed job. It's a Hawley Spider, that's the EFI unit installed on the vehicle. You can see down the barrels. The fuel and return lines are installed here. There's a cooling temperature sensor down around ... sorry I'm kind of moving the camera around too much. I'll just click back here with this look again. Cooling temperature sensor right here. Maybe just pause the video. You get a good view here. This cooling temp sensor here. And all the computer controls for this unit are actually all inside the throttle body except there's a little console piece that you have to install inside the vehicle so you can do all the tuning and adjustments. But, it's really pretty much all takes place inside this unit right here. So that kind of gives a good idea of that. So this is basically the way it looked after the installation. For some reason, somebody put this chrome air clearer on top of the snorkel piece originally, but it worked fine. That's the way it looked on the carburetor when it came in and it pretty well, you can't really tell it's got a throttle body fuel injection unit underneath. That's the old system, of course, with the old carburetor. Again, you know, not a huge amount of difference, but certainly the newer unit looks a lot cleaner. And as I said this little photo of the original tag L-48, 8-1/2 to 1 compression. This is a 1975, really probably one of the worst years in the US for performance cars with all the emission equipment they were forced to put on. I think, I looked at the specs and this engine has 165 horsepower. Whereas four or five years earlier, it would have had 300, 350, somewhere in that range. A huge drop in horsepower, so this fuel injection unit actually helps out a lot. Mark: And how did the car run and drive after the conversion? Bernie: It was awesome. As I mentioned, I mean, the owner's main concern was, you know, you start the car and it would tend to stall and just was fiddly. The moment we ... there's a few little tuning procedures you need to do before you start it up. We fired it up, started it up and it ran, like, perfectly the whole time. Just stayed at a nice steady RPM. I was kind of waiting for it to stall and it never did. Just expecting it to, but just like perfectly smooth the whole way. Went out and drove it. Tons of power. To be honest, I never really drove it before to kind of get a feel for the amount of power, but for certain it's going to have a lot more power than before. I would imagine the fuel economy would definitely be better, too, because now it also has it oxygen sensor monitored, so it's tune to the right, optimum air/fuel ratio. As best as you could get out of an engine like this, that's exactly why it's going to have. Yeah, really fantastic. I was really thrilled with the result, and highly recommend it for anyone who has an older car that wants to get the benefits and feel of a more modern vehicle. And yet it still sounds like a '75 Vet, which is cool. Mark: So any downside to installing an EFI system on an old car like this, other than perhaps the cost? Bernie: Yeah, cost is ... it's not a cheap job. But I say, none, other than, if you want you car to remain stock all the way through, then there's an issue with that. But otherwise to me it's just a no brainer. If you like the car, you want to drive it around a bit and you want it practical, this is just the best way to go. Mark: So there you go. If you're looking for some repairs or maintenance on your old classic vehicle in Vancouver, the guys to see are Pawlik Automotive. You can reach them at 604-327-7112 to book your appointment. You have to call ahead and book ahead, because they're busy. Or check out the website, pawlikautomotive.com. YouTube channel under Pawlik Auto Repair, hundreds of videos on all makes and models and years of cars and trucks. Or, thank you so much for listening to the podcast. Thanks, Bernie. Bernie: Yeah, thanks Mark and thanks for watching. Mark: Hi, it's Mark Bossert, Producer of the Pawlik Automotive Podcast and Video Series, and we're here with Mr. Bernie Pawlik of Pawlik Automotive in Vancouver, BC, Canada. Vancouver's Best Automotive Experience. 19-time winners, of Best Auto Repair in Vancouver as voted by their customers. How are you this morning, Bernie? Mark: We're going into the land of electricity today a little bit, dipping our toe in. We're talking about a 2013 Chevrolet Volt. What was going on with this vehicle? Bernie: This vehicle was brought to our shop, driven in. The electric motor works fine, but what would happen with this vehicle, as soon as the gas motor would run, within a few seconds the low oil pressure warning light would come on, and the engine itself definitely sounded noisy. Basically, there was no oil pressure in the gasoline engine. Mark: Okay, that's not a good sign. What tests and diagnosis did you need to do? Bernie: Well, this one was pretty simple. The owner had changed his own oil and filter and had mentioned, by the way, there was no oil. He said, "There's no oil in the filter." Which we pulled off and verified that was, in fact, the case. Normally, when there's an oil pressure problem, we would often do a test and verify with a gauge, but it's very apparent when you start an engine, the little oil warning light comes on. You can hear the timing chain rattling that there is, in fact, no oil pressure in the engine. From there, it was just time to do exploratory ...I was gonna say surgery. Exploratory dismantling and find out what had actually happened. We suspected probably the oil pump had come apart for some reason, but that's where we figured, so we started by removing the oil pan. Mark: You did some disassembly. What did you find? Bernie: The first thing we started with was removing the oil pan. It was the simplest and first logical step, and once we removed the oil pan, the oil pickup assembly is actually integrated with the oil pan. It's kind of a smart idea. Usually, it's a separate metal tube. Inside the pickup, there's a little screen to protect large particles from getting into the oil pump, and sitting on top of that screen, is kind of a V-shaped screen, was a piece of what looked like an impeller blade from the oil pump. So, we figured, "Hey, it's got to be the pump that's come apart." So, from there, we removed the timing chain cover and discovered that the oil pump was, in fact, I'd say blown to bits would be a good word. But, kind of broken to pieces. So, why don't we just have a look at a picture of that right now? So here's our oil pump. This is the timing chain cover over here. And the crank shaft goes right through here, and the oil pump sits here and there's a little ... It's a bit elongated, or sort of a couple of flat spots in the circular area that rub against, that attach to the crank shaft and that drives the oil pump. You can see that the red arrow here points to a very large crack, but you can see this whole rotor here is completely broken apart in several sections. One, two, three, four. These are the little impeller blades. As I mentioned, one of these was found inside the screen. Once we removed all this, we found the other ... how many more are we missing? Two more, lodged in behind the pump. Pretty important to find that stuff. You don't want that floating around inside the engine and ... So, anyways, we found all the missing bits and pieces. Now, this is an interesting oil pump. It's a variable displacement pump. Pretty common in a lot of modern engines. You know, with any gasoline engine, they're looking for maximum efficiency. Excuse me. And one way to get that, is to vary the displacement of the oil pump. The oil pump draws energy to pump the oil through the engine, so if ... and it's doesn't always need the maximum amount of flow and volume, so by varying the displacement of the oil pump, you can save fuel and still provide the proper amount of lubrication. So, that's what this big spring here is part of, and this whole section here will rotate and vary the displacement of the oil pump so it'll pump lesser or more volume depending on what position this is in. And this is common to a lot of, I say, a lot of modern car engines. Mark: So, this is a very involved job. How does the fact that this ... Does it affect anything, that this is an electric vehicle, as well? Bernie: Well, it does to a certain degree. I mean, the gasoline motor's separate on the passenger side of the vehicle, but there are some common shared components with the electrical system, the electric drive system, such as the air conditioner. And so, these components need to be de-energized before we disconnect wires. It adds a little bit of extra work to the job. You don't wanna have your hands anywhere ... The voltages are very high, and potentially deadly. So, you have to de-energize a few components, but other than that, it's pretty much like any other gasoline engine Chevy vehicle would be. Mark: Was there any other damage from those parts floating around, from the oil pump failure? Bernie: Well, no damage from the parts floating around, but of course, one serious issue is when you have no oil pressure in an engine, it can damage it pretty quickly. The owner said he never ran it for more than a minute, once the light came on, and of course, changed his oil and started it and found it wasn't working. We ourselves ran it a couple of times for a few seconds, which is not a lot of time. As part of our service, we removed one of the connecting rod bearing caps, inspected the bearing; looked perfect, as good as brand new. So, that's sort of one of the highest wear items in the engine, the connecting rod bearings, due to the forces and there's nothing that we found. So, figure it'll be ... We haven't actually put the vehicle back together yet. It's actually ... It's waiting for parts. It takes about a week to get the oil pump, which is part of the timing chain cover, and once that's back together, I'm quite confident it'll all work just fine. Mark: So, how are Chevy Volts for reliability? Bernie: Well, to be honest, we haven't ... we don't work on a lot of them. There's not a lot of them around. We're more than happy to do so, but the ... you know, as far as I know, the reliability is pretty good with them. I did a little online research just to see if there's any complaints. There's a few for a variety of things, and they seem to say this, 2017 models might be among the worst. But, of course, these'll all be covered under warranty 'cause they're near new. But I'd say, you know, I do know a couple people who own them, they've been pretty reliable vehicles, so again, there's a lot of complexity with this vehicle because you've got electric plus a gasoline motor, and it's interesting how, again, the failure with this vehicle is on the gasoline motor side of things. Mark: And this is ... the gas motor charges the battery, which drives the electric motor, is that ...That's how this, if I remember right, that's how this vehicle works? Bernie: It does exactly. It's a plug-in hybrid, so you ... Not a plug-in hybrid. It's a plug-in electric vehicle. So, you plug it in, and then it has the gasoline motor as a backup. Which is actually an excellent combination, when you consider, you know, you can really take this vehicle anywhere you wanna go and never worry about running out of either electricity or gas. I don't think the range is fantastic compared to, well, certainly nothing compared to a Tesla. But it's got good enough range to ... for most daily commutes, and you might never, almost never run the gasoline engine. But if you do, decide to go out of town and you want to keep driving, you can just keep putting gas in it. And it's a pretty efficient gasoline engine, so ... But, yes, that's exactly what happens. The gasoline engine charges the batteries. Mark: All right! So, there you go. If you're looking for service for your Chevy Volt, Bolt, whatever they happen to be making next, 'cause the Volt is now discontinued in 2019, as are all sedans in North America by Chevy, the guys to see are Pawlik Automotive in Vancouver. You can reach them at (604) 327-7112 to book your appointment. You must book ahead, they're busy! Or you can check out their website, pawlikautomotive.com. We have hundreds of videos on YouTube, Pawlik Auto Repair, on all makes and models of cars, all kinds of repairs. And of course, thank you so much for listening to the podcast. Thanks, Bernie! Bernie: Thanks, Mark! Thanks for watching and thanks for listening. We really appreciate it. Mark: Hi, it's Mark Bossert producer of the Pawlik Automotive Podcast. We're here in Vancouver this morning in an increasingly chilly October, with Mr. Bernie Pawlik of Pawlik Automotive in Vancouver. How are you doing this morning Bernie? Mark: So we're talking trucks today, 2002 Chevy Silverado that had a transfer case problem. What was going on with this Chevy truck? Bernie: So this vehicle came in for service. We do a lot of work on this particular truck, and the owner had taken it on an exceptionally long trip across Canada and back. If you look on a map, you'll see it's a long ways. It's a lot of driving. He came back, there was a few issues with the truck. We looked at it, and one thing we found was that there was a leak in the transfer case. There was an actual fluid leak in the transfer case, and the fluid level when we checked it was exceptionally low pretty much right off the edge. Mark: So where was the fluid actually leaking from? Bernie: Well interestingly enough, we found a little hole in the transfer case near the top there was an actual hole, and we'll look at some photos in a minute and I'll show you that. But that's basically where the fluid was leaking, it was actually a hole in the case housing. Mark: So how do you think a hole like this could develop? Bernie: Well we'll look at that in pictures in a minute, but there are a number of ways holes can develop. You could hit a rock, you could actually hit something with the transfer case. Or a strange circumstance, a rock could actually fling up. It's pretty thin aluminum. The case of this one, it was actually wear from a part inside that had been moving back and forth over, this truck has 300,000 kilometres, so over 300,000 kilometres this part, it's the oil pump, was moving back and forth back and forth, and eventually put a hole through the side of the case. Mark: So once you opened it up, was there any fluid in the case itself? Bernie: Pretty much nothing. As I mentioned, we check the fluid level and we basically found nothing in there. When we took it apart there was oil in it, but no appreciable amount. There's supposed to be two litres of fluid in this case, there was probably if you could scrape very drop of oil off the bearings and everything, there's probably a couple of tablespoons at most. It was basically surviving with just lubrication that was on the bearings themselves. Mark: You have some pictures. Bernie: I do. Let's go right into those right now. To start, there is the rear cover of the transfer case. You can see that okay? Bernie: Now if you look, it's an old dirty case, but if you look in this are a specifically you can see it's a little cleaner, there's a little more dirt and it's got some clean patches. So basically the hole is right over here, and I'll just close in a photo that shows a better view of that hole, which is right there. There's our hole. Tiny little, almost looks like it's meant to be there in terms of how nicely shaped it is. But that was our hole, that's where the fluid leak. And it was at the top of the case, which is fortunate because it had probably been leaking for a while and splashed out over a long period of time. So we'll go back into some other photos. So here's the inside of the transfer case. This is after reassembling it, so this is the transfer case chain. This is one of the main components of a transfer case, this is the chain that basically allows the drive to go ... This shaft here will go to the rear wheels. This connects up to the front drive shaft to drive the front axle, so that's how the. Again, the chain and these gears are one of the main components of the transfer case once you switch into four-wheel drive. To switch from high to low gear, down in this area of the case there's a planetary gear there's a shift fork and that'll make an adjustment. So that gives you the low gear range that transfer cases, most of them have. Here's the inside of that new housing. We were able to replace this housing. And the wear was basically occurred in this region here, from the oil pump, which sits in these four places here, it just has a little bit of movement and over time, 300,000 kilometres, it just moves around a tiny bit, tiny bit, tiny bit eventually it just wore a hole through the case. This replacement case is actually made of a better grade of aluminum than the original, so it theoretically should never happen again. But the ironic thing is they actually put these clips in, and we found one that was broken apart. There's a couple clips, they're called case savers, and they're actually meant to prevent this from happening. But strangely enough, they don't. It actually slapped around enough and wore the case saver and a part, and then just wore it through the case. So this is kind of a useless piece, it's not really important to replace. It doesn't come with the rebuild kit, you can get them but they're really not an important item to use. Mark: So how could the unit survive without fluid in it? Bernie: Well gear boxes do, they do get hot they get warm, but they're not hot like an engine, so they can survive with just lubrication that's on the surface. It's hard to know how much longer this case would've gone, but they can survive for a long time without actually being full of oil. We've run into a number of transfer cases over the years where a customer brings a vehicle in, it's basically got almost no fluid in it whatsoever, and we fill it up and away it goes and it's no problem. I'm not saying I recommend that at all, you should always keep it full because of course there was some wear inside this case, nothing major though. We replaced all the bearings of course because we were in there, but there was nothing major worn. All the gears were in good shape, the chain was in good shape. We replaced it anyways because it's a good thing to do with that kind of mileage on it, it'd be kind of crazy not to change the chain because they do stretch over time. But nothing really severely worn. The only other major component we found, was one of the shift forks was worn and it has plastic tabs on it. So over time that had worn, it's hard to say whether, chances are it was well lubricated it probably would've been in better shape, but you never know if we would've taken it apart we might have found it was still equally worn. Mark: So what are the most common problems you find with transfer cases? Bernie: There's a variety of things that happen, and there're different types of transfer cases. So this one, for instance, is a fully manual two speed transfer case. It's kinda common on a lot of heavier duty type of trucks. So this is the one that has the shifter on the floor where you have to mechanically move the shifter. A lot of transfer cases are electronic. There are some, let's say you got a BMWX drive vehicle like an X5 SUV, that has a transfer case that's very similar but it's all electronic. You don't even push buttons. It's all computer controlled, so it'll shift the four-wheel drive or all-wheel drive, it'll make adjustments computer controlled. And then there are other versions that are sort of semi-automatic. I've got a Suburban and it has basically a push button, you push a button on the dash, it'll switch into four-wheel drive. And then you can switch into low range, and again it's push button. And the way that's done, instead of having the lever on the floor it basically has a motor. It looks kind of like a windshield wiper motor, and it basically actuates the, moves the forks back and forth. That's actually a pretty common problem. The actuator motors will go bad. The chains will stretch. Those are common things, and from time to time bearings will wear also. But fluid leaks are probably the most common we see in it and repair. And of course, if you fix a fluid leak you're preventing other damage. This is surprising we caught this transfer case at the right time. Had he driven it for another few months, it for sure catastrophic damage would've occurred. Mark: And are there any transfer cases that are worse than others? Bernie: They're all pretty much, I'd say they're all fairly equal, at least as far as if we think of a North American truck style transfer cases. A lot of them are made by New Process, which is a transfer case manufacturer. So there're different grades in these transfer cases depending on if you have a half ton, three quarter, or one ton vehicle. There are other brands as well, but there doesn't seem to be any particular, Chevy's are better than Ford's or Dodge's, they're all kind of created equal, even amongst the imported vehicles. But when things go wrong say with those BMW type of transfer cases, they're much more expensive because the gear mechanisms are the same but the intricacies of how the other components work are the shifting mechanisms are much more complicated. So I'd say they're all, if you're thinking I'm only going to buy this vehicle because the transfer case is better, then don't worry about. They're all created pretty much equally. Mark: So there you go. If you've got any issues with your four by four in Vancouver, the guys to see are Pawlik Automotive. You can reach them at 604-327-7112 to book your appointment. You have to book ahead, they're busy. Or check out our website, pawlikautomotive.com, we have hundreds of videos on our YouTube channel, Pawlik Auto Repair. Thank you very much for listening to the podcast. Thanks Bernie. Bernie: Thanks Mark, and thanks for listening and watching. Mark: Hi, it's Mark Bossert here, producer of the Pawlik Automotive podcast, here with Mr. Bernie Pawlik. We're talking cars. How you doing, Bernie? Bernie : Doing very well. Mark: So, we're talking about a Chevy Suburban, had a oxygen sensor replacement, which is a pretty common issue. What was going on with this large SUV? Bernie: Well the check engine light was on. We scanned the vehicle computer. There was two codes for heated oxygen sensor circuits, for the front two oxygen sensors. Mark: So, what does an oxygen sensor do? I know we've talked about it with other vehicles. How does it work? Bernie: So there's a couple of functions for oxygen sensors. This vehicle is a 2001. It's a little older, but the technology is the same, even right up to brand new. Essentially, what the oxygen sensor does, is it reads the oxygen content in the exhaust and sends a signal to the vehicle computer. With that it can do a couple of things. There are your front oxygen sensors. These are located in front of the catalytic converters, right at the downstream of the engine. It'll read, is the engine running rich or lean. It sends a signal to the computer, it's rich. The computer leans out the fuel mixture, gets a signal it's lean, it richens it up and this cycle happens very quickly, like imperceptible. It richens and leans the mixture, so it makes quick readjustments for optimum fuel mixture, based on what the computer wants. The rear oxygen sensors are located downstream of the catalytic converters. What they do, is they monitor the efficiency of the catalytic converter, to make sure it's working. Essentially, modern vehicles ... used to be in Vancouver, we'd have air care and a lot of the testing was done with a dynamometer, with gas analyzers. You don't need to do that with any vehicles that are built after 1996. They're all self-diagnosing vehicles, because it has an oxygen sensor downstream of the catalytic converter. That's essentially what an oxygen sensor is, and how it works is it basically generates a voltage based on how much oxygen is in the exhaust system, so basically kind of a self-generating piece. Mark: So mainly, let's just dig into a couple things. So rich and lean is referring to how much fuel there is in the air/fuel mixture? Bernie: That's exactly what it is. There's a certain ideal ratio, about 14.7 to 1. It depends on what condition. If you're stomping on the throttle, and you want to go really fast, you want a richer mixture. If you're coasting down a hill, it goes leaner, but the vehicle computer's programmed for whatever that optimum mixture is. So yeah, it's a air to fuel ratio. Mark: When you were mentioning downstream, you're talking about what's coming out of the exhaust, going out the tailpipe. Bernie: Exactly, yeah. Downstream is like from the engine. If you can imagine, the exhaust is like a river. It's going down ... I don't know, river, downhill, exhaust, the stream exhaust goes out of the engine, goes back to the tailpipe and out into the air. Mark: All this is an aid of basically the vehicle running good, but also it's an important factor in removing pollutants from the exhaust stream. Is that right? Bernie: Absolutely. Absolutely. In the olden days, when cars had carburetor and they just kind of calibrated everything as best they could, there was no oxygen. It actually went to a feedback carburetor, which actually had an oxygen sensor and it would actually readjust the carburetor, but it was very crude. There's only a certain, limited amount of adjustment you can make on a carburetor versus a fuel injection system, which is why everything's fuel injected. So much more control. Mark: Are there any other types of sensors in the exhaust stream that are part of this process of making sure the engine's running right? Bernie: On a gasoline engine, there isn't, but we say oxygen sensor, there's actually a lot of vehicles use what's called an air/fuel ratio sensor. This Suburban is kind of older. It's a 2001. It uses an oxygen sensor in the front, but a lot of newer vehicles will use what's called air/fuel ratio sensor. It performs the same basic function, but it works differently. It's able to make adjustments to the fuel system much quicker and over a wider range. It's often called a wide band oxygen sensor as well. It works a little differently, but essentially the same function. They usually cost a lot more money than an oxygen sensor. Other than that, that's the only two ways they do it. Mark: How often to oxygen sensors wear out? Bernie: Well, this Suburban that's actually got over 300,000 kilometres, and the sensors have finally worn out, but they'll typically last 100,000 to 200,000 kilometres. Just a little history, in the olden days the oxygen sensor used to be a single wire, and it would self-generate its own electricity. Electric voltage signal, usually from zero to one volts, based on how much oxygen was in the exhaust. It would have to warm up and be at a certain temperature. It would often take a few minutes of engine running to get that sensor warmed up. In the meantime, the fuel system is what's open looped. It's pumping a lot of pollution, so what they did is they created a heated oxygen sensor, which everything has been for a long time. Heated oxygen sensors not only work almost immediately, like within a few seconds, but they also last a lot longer, so a single oxygen sensor in the past would never have lasted as long as the ones in this Suburban. Mark: How would I know if the oxygen sensor were worn out on my vehicle? Bernie: Normally, it's a Check Engine light issue. The Check Engine light comes on, and through diagnosis, we find the oxygen sensor's worn out. Occasionally, you'll have a physical problem, like the sensor will actually break apart. Maybe they'll be an exhaust leak. Not very common. Usually, 99% of the time, it'll be through the Check Engine light deal and diagnosis, so that you'll know that sensor's worn out. Mark: Is this a large job, to replace these sensors? Bernie: Well, it can and can't be. The Suburban was absolutely miraculous and beautiful. Oxygen sensors have bolted in the exhaust, and as you can imagine, there's a lot of heat that takes place. There's a lot of rust that occurs. Often, when we go to remove them, they won't come out very easily, but when you install a new oxygen sensor, you also put some Never-Seez, which is a compound that supposed to prevent the threads, as the name implies, never seize. They obviously did well with this vehicle, because all four oxygen sensors requires a little crack with a wrench, and I was able to spin them all out by hand, which is kind of miraculous. We have a lot of vehicles, where you go to undo it, and it takes the threads out of the exhaust system, involves a lot of extra repair. Mark: So, what do you do in that case? Are you welding in a new piece, into the exhaust system? Can you even do that? Bernie: Yeah, you can. Actually, you can cut the old piece off. It's called an 02 sensor bung, and we can just weld another one in and away it goes. It's a bit of extra work. Now, depending on where it's located, it might actually be a lot of extra work, because some oxygen sensors are buried way in the engine compartment. There's no room to move, and so it can be a lot of work. Mark: And this Suburban, as you mentioned, is getting on a bit in age. Is it still a worthwhile vehicle to keep on the road? Bernie: Absolutely. Again, it's all about maintenance, but like a 2001 Suburban, it's kind of when they changed this newer style of vehicle. I think GM has done a great job with these Suburbans and these pickup trucks of this era. They are far more reliable than they used to be in the past. Brakes last a long time. The engines are really good. Overall, a really good vehicle. I recommend them. Just keep them going. Just do the maintenance as things need to be done and the repairs. It's a good vehicle, last a long time. I realize we've been talking a lot. We haven't shared any pictures, so let's go to look at a couple of pictures. These are the four oxygen sensors that were removed from the vehicle. The front and rear are actually different sensors, but the function they perform is the same. There's some calibration, there's something that's a little different between that two of them. So these are the four sensors that have been removed. You can see that these are plugs have been connected into the wiring harness. This is the end that screws into the exhaust system, over here. It looks kind of crusty and old, because it is. The next picture we'll go to, this is a close-up view of the wiring connectors. I mentioned, in the olden days, there was just a single wire oxygen sensor. Usually, on the GM it was a purple coloured wire. One of these wires is a ground wire, to make sure there's good ground to the sensor. Then the other two wires are for the heating circuit. So the heating circuit's monitored by the vehicle computer, and as I mentioned, there was a trouble code for this. If something goes wrong with the heating circuit, which is a frequent problem in these sensors, it'll set off a trouble code, saying the heater's not working. Finally, a view of a 2001 Suburban. There we go. Still in good shape after all these years. Mark: Awesome. So there you go. If you're looking for service for your Suburban, or for an oxygen sensor replacement in Vancouver, the guys to see are Pawlik Automotive. You can reach them at 604-327-7112. Or check out their website, pawlikautomotive.com. Or our new podcast and channel on YouTube. Check us out. There's hundreds of videos on there. Thanks Bernie. Mark: Hi it’s Mark from Top Local, we’re here with Bernie Pawlik, Pawlik Automotive in Vancouver, Vancouver’s best auto service experience, 17 time winners of Best Auto Repair in Vancouver as voted by their customers. How’re you doing Bernie? Mark: So we’re going to talk about a classic some people would say, other people would say a strange vehicle to begin with but beauty is in the eye of the beholder, this is a 69 Chevrolet Corvette that was having some headlight issues. What was going on with this vehicle? Bernie: Well basically the headlights on this vehicle, sometimes they come on, sometimes the high beams would work, sometimes the low beams would work, sometimes they just shut off completely. So there’s quite a few issues with the headlights on the vehicle but not reliable that’s for sure. Mark: So it sort of sounds like a vintage English car but I guess, this is a 69 so it’s got the hideaway headlights, I bet that was fun! How was that to deal with? Bernie: Well it definitely adds some complexity to the repair but in this case, this was a purely an electrical issue. Hideaway headlights are kind of neat in this car but that’s a complete vacuum operated system which is kind of a, I don’t want to say a nightmare of it’s own, but it has a vacuum system, basically it uses the engine vacuum, there’s a little storage tank and a bunch of switches and valves. So when you turn the headlights on, it actually pops the lights up and it closes them down when you shut the switch off and you can also flip them up manually to leave them up all the time. This car is a bit of a, you know not perfect, it needs a bit of work. So the actual headlights have to be operated up and down with the manual switch but there’s not much crossover between the electrical and the vacuum system, they’re separate, so when the lights actually don’t illuminate that’s actually an electrical problem. Mark: So what do you do to start diagnosing this kind of issue? Bernie: Well, I’ll start, within the electrical problem,you got to start at one end and you know just from experience, pick which end you want to start with is it the end where the headlight is or is at the end where the switch is and it’s a lot easier to access the headlights and the owner had just bought this car and there was a box of new headlights in there that the previous owner had said, hey you should change these lights. So I thought well, he want them done anyways so we start with the headlights, pulled everything apart and what we first of all found, a few of the headlights were actually broken so that was part of the issue but in being able to take the lights out, we were able to test the wiring and found that there was a bad ground to the lights and in fact, a lot of the front lights didn’t work as well. So it’s a matter of finding that common ground wire and why that connection, and why that end of it wasn’t working. Mark: So what else did you eventually find that was the problem and how did you fix it? Bernie: Well what we found is the ground wire is located near the front of the vehicle, near the headlights on a metal tab, interesting thing about a Corvette is it’s a fibreglass body car, so there’s lots of metal around that it’s not as plentiful as an average car which is all made of steel, so you have to hunt around for your ground wires. The wiring, there is a little more wiring on a Corvette than it would be on an equivalent 1969 car because the body isn’t a complete ground. So once we found the ground wire, found the bad connection, but the connection actually ended up not being repairable so I ended up finding a new ground source and repaired that. So I’ll just share a few photos while we’re at this juncture here and here’s a of view of the hideaway headlights. This is the passenger side, you can see that there’s a covering around the headlight and the drivers side, here I actually took this picture when it was partially apart. I don’t have any fancy videos or things going up and down, it is kind of cool to watch but we’ll do that at a later date. Here’s the passenger side of the cover, there’s a cover that lifts, a few screws you remove and then you can get at the lights and remove them. What is kind of neat about this cover, it’s a 69 car, the cover which on any modern car, even you know a few decades old, would be made of plastic. This one’s made out of like a thin, tinny pot metal. So it’s kind of neat working on this kind of stuff, it’s kind of like working on a museum piece in a way that still drives down the road. The wiring problem, there’s our ground wire, it’s a close up view, that’s the actual wire that was bad. I cleaned it up first of all, this is the hole where it screws into, you can see it’s a fairly thin gauge piece of metal and when I went to screw it back in, it just wouldn’t tighten back up which happens. It’s probably really good for one or two, in this case only one shot, it’s probably never been removed since the factory but there’s basically corrosion that built up in this area and just wouldn’t allow the ground connection to happen. So we’ve got a better source elsewhere. Mark: So we don’t really have, we haven’t often spoken about cars this old, do you work on a lot of vintage cars like this? Bernie: Not too many and to be honest, we try to avoid them in our shop. It’s tricky to get parts for old cars but I will say that we seem to work on a lot of old Corvettes and a lot of older Mustangs. These are two cars where you can actually get a lot of parts fairly easily. I mean things like, I should say on this Corvette there’s a couple other problems with the lights too, the high beam-low beam switch which is located on the floor was broken and these are parts that you can still buy quite easily. So some of these parts I mean, they just made millions and millions of them. Same switches used on GM cars for, as I say, like millions and millions of them. So there’s still the demand to make parts but you can pretty much buy anything you want for one of these Corvettes, unfortunately a lot of it is cheap made in China junk, which is kind of unfortunate. So it’s a little bit of work to find the right parts, but there’s a few select vintage cars we will work on in our shop and they’re kind of fun. Although I’ve kind of made myself the vintage guy here now because I kind of grew up with these cars, a lot of my newer, younger guys are like, oh how do you fix that? I go, I’ll just take care of it, it’s easier. Mark: Hi it’s Mark from Top Local, we’re here with Bernie Pawlik, Pawlik Automotive, Vancouver’s best auto service experience. How’re you doing this morning Bernie? Mark: So we’re going to talk about a 2007 Monte Carlo that had an automatic transmission problem. What was going on with this Monte Carlo? Bernie: Well, first step of course is always for us to road test the vehicle, the client was experiencing some shifting problems, I drove the vehicle and definitely noted there’s some shifting issues. At first it seemed to be fine and then there was the odd, a sort of three four, third to fourth gear type shift there was a kind of a weird feel to it and then I noticed after a while of driving, I’d stop and go to start and it would jump out of gear and then jump back in again. So that was clearly a pretty significant problem. Mark: So what kind of diagnostic steps did you do to narrow down what the problem was? Bernie: Well first thing of course is a road test to verify the concern, which we did, second plug a scan tool into the vehicle, I mean this is an 07 there’s lots of computer controls in the transmission, plugged the scan tool in, see if there are any trouble codes, that gives us an area to look and there was actually none. And my kind of initial, my gut feeling from driving it is maybe there’s a fluid problem, maybe the fluid level was low and sure enough, the next step was the check the fluid level. 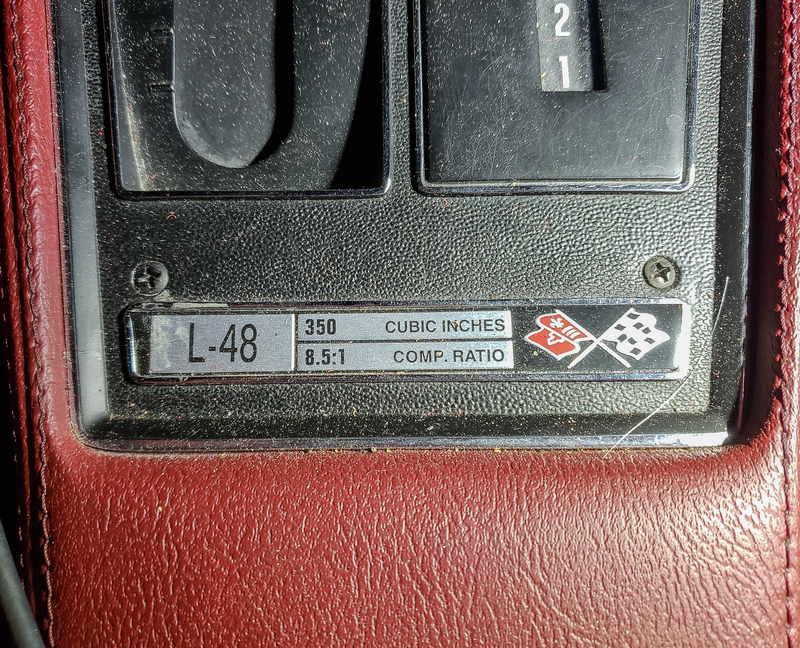 This vehicle has a dipstick which surprised me because a lot of GM’s of this vintage don’t have dipsticks and you can still check the level, it’s just a lot more work. Put the dipstick in, pulled it out and the fluid wasn’t even reading on the stick. It took two litres of fluid to actually get the reading close to normal. From there we road tested the vehicle to see how it works and it shifted fine which I kind of suspected it would. Mark: So what else did you do? Bernie: Ok so from there, basically the next step was to, we could of let the vehicle go at that point because it was working but the fluid was discoloured and it makes send to look inside the pan and see if there’s any damage. Also of course, why’s the fluid level low? So we looked underneath, did an inspection and found the leak was coming from the transmission pan gasket and you know, that’s a pretty common spot for a leak. So we pulled the transmission pan down, inspected inside, fortunately there was absolutely no filings, materials like particles of any sort which is really good news for the owner of the vehicle. Yeah, so that’s basically what we did from there. Mark: So how did if work after the service? Bernie: Oh it was awesome. So what I should add is in addition to changing the pan gasket and filter, we also did a transmission fluid flush because the fluid was old and discoloured. So yeah it was great, road tested the vehicle, worked absolutely fabulously and I want to share a few photos while we’re at it because it’s interesting, so where were we here, so here’s our Monte Carlo, good vehicle. I know for quite a few years they built this car looking at the same type of design of vehicle so it actually surprised me it was when they got it it was actually new as it was, I thought it was a lot older. Anyway so here’s the transmission pan that we took out. Now I’m going to share a couple photos of this pan. So this is the pan, and this area here, someone has used a cork gasket and put some silicone or some Right Stuff Gasket Sealer on there, probably nothing really wrong with it, it’s not exactly the right gasket, but they tightened it way too tight and this area here, it’s actually the middle of the pan they tightened it so tight that the cork is squished right out and that was one of the causes of the leak. And now I’ll share the other photo, this is the proper pan gasket that’s supposed to be in there, you can see it’s a very elegant, thin gasket. This is like a metal cored gasket with molded rubber and it’s actually supposedly a reusable gasket, we normally change them but you can take them off and reuse them. They’re meant for multi purpose use. So again, we put the proper gasket on with the filter and it works fine. Mark: So we don’t see a lot of these Monte Carlos, how are they? Bernie: Pretty good cars, as I say, yeah we don’t really see many of these cars, I don’t think they made a lot of them but when you open the hood, it’s a typical GM vehicle of that vintage, I’m trying to think of others but there’s other Chevy’s, there’s Pontiac’s and Buick’s that if you look under the hood they have the same engine configuration, same transmission, generally a pretty reliable vehicle. A few problems here and there but overall pretty good car. Mark: Alright if you’re looking for service for your GM vehicle, the guys to see in Vancouver are Pawlik Automotive. You can reach them at 604-327-7112 or check out their website pawlikautomotive.com. Thanks Bernie. Mark: Hi, it’s Mark from Top Local; we’re here with Bernie Pawlik of Pawlik Automotive in Vancouver BC. Vancouver’s favourite auto service experience, 16 time winners of best auto repair in Vancouver so far as voted by their customers. How’re you doing Bernie? Bernie: I’m doing very well this morning. Mark: So we’re going to talk about a Chevy HHR, a real bit of an uncommon vehicle, this is a 2008; you did an engine replacement on, what was happening with this vehicle. Bernie: Well this vehicle came to us, the owner of the vehicle experienced some engine issues. It wasn’t running well, the check engine light was on and it was running very poorly, quite roughly. Taken it to a GM dealer for a diagnosis and they told him the his engine needed to be replaced so he came to us for a second opinion on that. Mark: So what did you find wrong with the engine? Bernie: Well we found that the engine did in fact need to be replaced. There was no compression in number three cylinder and number four was a little on the weak side and also when you take the oil cap off there’s a lot of blow back, there’s a lot of pressure in the crankcase which, which would indicate something perhaps more serious than just, you can have low compressions from often it’s a bad valve but if you have like a lot of crankcase pressures it can be you know, perhaps it’s got a cracked piston or piston rings so, so the engine itself is definitely in very bad shape. Mark: So what did you end up doing to repair the motor? Bernie: So we put a used engine in the vehicle that was the most cost-effective repair to do on the vehicle, we removed the old engine and put a used engine in. Mark: So how does a used engine compare with a new one? Bernie: Well, cost is a huge factor I mean, you get this HHR, it’s not worth a huge amount of money at this point, it’s a nine year old, an almost ten year old vehicle, it’s a GM, it’s not, 150,000 kilometers, not worth a huge amount of money so a rebuilt, a rebuilt engine you know would probably cost somewhere around the $4,000 range just for the engine itself. We were able to get a used engine for about $1,200, low mileage, 70,000 kilometers so much more economical. The labour is pretty much the same to put a rebuilt or a used engine in but you know, used engine is certainly much lower price. Now a used engine is used so you know, there is a risk that we don’t know how it’s maintained so you’re buying something, there’s a definite risk to it, the warranty’s much shorter, usually a rebuilt engine is one to two years sometimes more on warranty, a used engine 90 days, so there’s a bit of a risk. We do lots of them and they tend to work out pretty well. Got a few pictures to share, while we’re at it, here’s our HHR engine, and actually I’m showing these out of sequence, but this is actually a back view, when you do an engine change in this vehicle you, you drop the engine and transmission assembly, it’s all held in and it’s called the cradle, it’s the front cross member, they built, they put everything together at the factory on this cross member and we basically when we do the engine job we just lower the whole cradle down with the engine and transmission and this is a view of the steering rack and this particular item here, I’m just pointing out, this is the steering shaft; what’s interesting about this vehicle, it has electric power steering which is a technology that’s pretty common for vehicles built in the last 10 years, some cars have it some don’t but it’s nice because there’s no hydraulic system, there’s no power steering hoses, there’s no power steering pumps, there’s a lot less, makes the job a little easier to do, a little less involved. There’s a larger view of the engine on, on the, this is actually a back view of the engine on the cradle still, this is the exhaust manifold we got the valve covers here, the transmission sits over in this area and then last photo to show you will be a front view of the engine, there we go, there’s a, there’s a front view of the engine sitting on the cradle again and there’s a number of accessories, things like the alternator that needed to be removed, transferred over but that’s, that’s generally what it all looks like on the . . . I think I close that, I think I’m back. So I can’t remember where we were for questions. Mark: So what was the vehicle owner’s history with the car? Bernie: Well that’s a good question, interesting question. He had actually just bought this vehicle and this could lead into a whole new hangout, but I’ve often said if you’re going to buy a vehicle, have it inspected because you never know what’s wrong with it and I asked what happened with it and he said well, we bought it and it had the check engine light on so obviously the price was probably a little cheaper, he said I figured it probably just needed some spark plugs. An expensive, expensive lesson in having a vehicle checked out beforehand because never make the assumption, I would always assume it needs the worst thing, if it’s something simpler the better but if you don’t really know get the vehicle inspected, I mean save money. I don’t want to talk about the bill for this job but you know, so there’s a lot of labour to put an engine in and also the catalytic converter was also damaged too because the engine had been running roughly for so long it damaged the catalytic converter so, you know a lot of expenses. Mark: So how are HHR’s for reliability? Bernie: I’d say they’re fair, and I won’t say fair, we don’t service a lot of them because they’re not the most common vehicle but this engine by the way is out of, came out of a Chevy Cobalt, so the drivetrain is very similar to a lot of other GM vehicles. They’re fairly reliable, not a lot goes wrong with them but you know, when you got a HHR was only a few years old with the actually exhaust, the exhaust pipe was cracked and leaking and needed to be replaced and just things like that strike me as not great quality but you know I’d say they’re sort of below average but not bad vehicles. Mark: A little bit on the more inexpensive side? Bernie: Yeah I would say, yeah. I mean, generally vehicles, American vehicles have always traditionally depreciated more than Japanese vehicles. I compare your Japanese, I mean European vehicles are more luxurious, they often start at a higher price, many of them depreciate very quickly as well but some of the Japanese for depreciation are the least, and American vehicles are definitely pretty high so you can get good deals on them. Just make sure if you’re buying a used one that it’s running right, have it inspected, and see if it’s worth the money. Mark: So there you go, if you’re looking to get a new vehicle, a new used vehicle, a pre-owned vehicle then the guys to bring your vehicle in to see are Pawlik Automotive, they’ll give you a good idea whether it’s a useful buy or not or if you just need service on your vehicle, your check engine lights on, get it into somewhere so they can take a look at it, it’s not something to be driving around with it on all the time. Bernie Pawlik at Pawlik Automotive, you can reach them at 604-327-7112 or check out their website pawlikautomotive.com. Thanks Bernie. Today’s featured service was performed on a hardworking 97 Chevy Van with 260,000 kilometers. The vehicle serves as a carpet cleaning van, and consequently has a lot of engine run time due to operate the large carpet cleaning machine. Several driveability concerns were present with this van requiring two stages of diagnosis to return the vehicle to a good state of repair. I consider this to be a complex diagnosis: complex because it takes the repair of one thing to reveal other underlying issues. Complex diagnosis is fairly rare and occurs about 5% of the time, but it happens almost exclusively with neglected vehicles. Our featured van was one such example, but not the fault of the current owners for they had just purchased the vehicle. Let’s look at our featured Chevy van: as I mentioned this vehicle was recently purchased and while out driving to a job it lost power and wouldn’t climb hills well. They were able to drive it to the shop and we proceeded to perform diagnosis. On our road test it seemed likely that the lack of power might be due to the engine being starved for fuel. We connected a fuel pressure gauge and verified that the pressure was below spec. We also noted that the fuel pump volume was very low: the engine was starving for fuel and we traced this to a worn out fuel pump. The pump was replaced and while at it we also replaced the fuel filter. This was found to be partially plugged. Here was the first sign of neglected maintenance. The pump failure was more than acceptable given the age and mileage of the vehicle however had the filter been changed sooner the pump may have lived a longer life. After pump replacement the engine started right up and driving it was a treat: there was lots of power. The next day however the engine wouldn’t initially start but eventually did, and it appeared flooded. We assumed that perhaps the engine computer was injecting too much fuel with the pump now working properly. Engine computers adapt to different conditions and sometimes take a few days of driving to readjust. 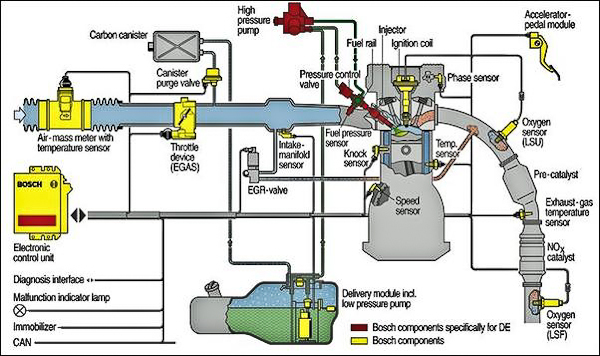 Modern gasoline fuel injection system diagram. Note the numerous sensors and components. All of these and potential failure items. Going forward a couple of days the van had starting problems and we towed it back to our shop to rediagnose it. Our first test was to verify that our new fuel pump was not the problem and it was not: fuel pressure was good. Unfortunately the van started up after being towed to our shop so we had to drive it for a couple of days and let it sit until the symptom reoccurred. This added another level of complexity to the diagnosis: when a concern is intermittent we need to test the vehicle when the problem is occurring to be sure that we find the cause. When the no start finally reoccurred we were able to trace the problem to worn out spark plugs and spark plug wires. Under certain conditions the spark plugs were not able to ignite the fuel. During the spark plug replacement we found the spark plugs to be an old design of Bosch Platinum spark plugs that were problematic. The plugs and wires were again an example of poor maintenance. 1- Most vehicle diagnosis is a straight forward procedure if you address it quickly after the concerns start. It is often more complex when left and the vehicle is neglected. Performing routine maintenance: replacing fuel filters & spark plugs at the recommended interval is critical and will increase vehicle reliability and reduce diagnostic costs. When buying a used vehicle there may be repairs involved to deal with the previous owner’s neglect. This is often found in a prepurchase inspection. 2- With a diagnosis like this it is very important to trust the shop that you are dealing with and be sure they are trust worthy. If you don’t understand why you have to do multiple repairs be sure they are able to explain what is happening. A car or truck is a very complex machine and many things can and do go wrong: sometimes simultaneously and at other times in rapid succession. Some problems, once repaired will reveal other underlying issues. Today’s featured repair is heater core replacement on a 2003 Chevrolet Impala, brought to us by a client from UBC, Vancouver. The heater core is a mini radiator that sits inside the heater box, under the dash of your car. It uses heat from the engine’s cooling system to warm your vehicle’s cabin. Failures of heater cores happen in two ways: first and most common is leakage; second is blockage of flow resulting in little or no heat. When heater cores leak they normally soak the floor and carpet with engine coolant. You will also likely see steam on your windshield when you turn on the defroster and a strong odor of engine coolant will be present. This is precisely what happened to our featured Chevrolet Impala. But there was more: the engine coolant in this car was in very poor condition and contained a lot of rust. Rust occurs from poor cooling system maintenance and/or using a weak antifreeze mixture with too much water. Part of our service on this vehicle was to do a thorough cooling system flush. The sad thing is that once you have this amount of rust it is impossible to completely remove it without completely dismantling and cleaning the engine, replacing the radiator and heater core, and all the cooling system hoses and pipes. That is a horrifically expensive proposition so the vehicle owner will have to deal with a slightly compromised cooling system. Heater Core removed from 2003 Chevrolet Impala. Note the very rusty coolant that was inside the core. This will be present in the rest of the cooling system. We proceeded to replace the heater core and vacuumed and washed the coolant from the carpets. We flushed the cooling system and refilled it with fresh new antifreeze. Proper heat was restored and the cooling system will survive to keep the engine cool. Heater core failure is not too common of a repair these days. It seems that American made cars have always suffered from more frequent failures; many Japanese and European cars will never experience a leaking heater core. The cost of the heater core is usually inexpensive but the labour on many vehicles car be very costly. Though it’s no guaranty, the best way to prevent heater core failure is with proper cooling system maintenance.